Probably the first thing you’ll notice on looking around is the absence of an oven. You’ll see one in a Chinese restaurant kitchen - for roast duck and the like - but even today, very few households in China have an oven. The majority of cooking in the Chinese home is done on the hob. The earliest stoves discovered in China date back to about 200 BC, and similar cast iron stoves are still to be found in many rural homes today, with gas being the favourite fuel as it gives a powerful but controlled heat. Another piece of kitchen equipment that most of us couldn’t live without but that is still a rarity in many Chinese homes is the fridge. Although the Chinese have been using ice as a preserving aid since ancient times, it’s only in recent years that fridges have become easily available. As yet they’ve not replaced the daily trip to the local market for many people. Many of the pots, pans and utensils you’ll see will be familiar but probably the most vital and versatile piece of equipment for Chinese cookery is the wok. With its sloping sides and rounded base, it can be used for stir frying, deep frying, stewing or steaming. If you have an electric hob, you will need a flat-bottomed wok.You can use a wide frying pan but it won’t have the versatility of a wok and the best sort to buy is a traditional one made of uncoated carbon steel. Avoid stainless steel, Teflon-coated or electric! Follow the manufacturer’s instructions or this procedure. 1. Scrub with soap and a wire wool pad to remove any protective coat put on by the manufacturer. Rinse. 2. Fill with water and boil, then empty out and scrub again with soap and wire wool. Rinse. 3. Put the wok over a high heat and dribble in some oil. Spread the oil over the surface of the wok using kitchen towel and chopsticks or a long-handled fork. 4. 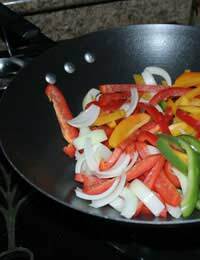 Turn down the heat and leave the wok over it for about 15 minute so the oil can be absorbed. If it looks as if it is drying out, add a drop more oil. 5. Leave the wok to cool then repeat the whole procedure. At the end of this you should have a wok that will be non-stick and that will lend its own flavour to the dish. Use hot water and a plastic scourer or bamboo brush. Don’t use soap or wire scouring pads. Dry thoroughly. If you do need to use a wire scourer to remove burned-on food, you should re-season your wok! These are meant to sit inside the wok and usually come in several layers so you can steam a number of different foods at the same time (the ones needing least cooking go in the top layer). The steam from the water rises up through the bamboo and is able to circulate freely. And food can even be served straight from the steamer! To clean a bamboo steamer simply rinse with hot water. Don’t use soap as the taste of it will be absorbed by the bamboo and unpleasantly flavour your food. The wok sang is a long-handled, wide, rounded spatula that makes it easy to toss food in the wok.The clay-pot is similar to a casserole dish but it’s used for cooking on the hob.Chopsticks are sometimes used for putting ingredients into - or taking them out of - a wok. They’re especially useful during deep frying. And, of course, for eating with afterwards!